Here’s a chic little number; a rather moreish take on the world’s favourite type of white wine: De Martino Legado Chardonnay. And this week, I’m featuring two different years of the same wine – 2015 and 2016 – because they are quite different and a great example of something few people mention here in Chile: vintage variation. Anyway more on vintage variation later. First let’s talk about these two wines. This pale yellow wine has a pronounced nose with distinct layers of aromas. First up are the enticing notes of brioche and pastry due to the wine being stored over its lees (sediment) and stirred from time to time. Then there is a layer of fruit aromas, particularly zingy citrus fruit, like lemon sherbet and lemon zest, as well as crisp green apple. Finally there is a sweet caramel smell suggestive of some contact with oak. In the mouth, the wine is dry, with high acidity and medium body and a lovely creamy texture. The flavours are relatively pronounced, featuring the same brioche, lemon sherbrt and apple notes, but there is a slight sweet touch, like caramel too. Fairly long. A very beguiling wine that entices you to pour another glass. This pale yellow wine has a medium nose, much more subtle than the 2015 version. The aromas are more difficult to pin down – a citrus note, ripe lime perhaps – together with some white fruit aromas, like melon, peach and apricot. There’s also a floral hint – something like orange blossom – and some brioche-like notes from the lees stirring again. But all in all, the aromas of this wine are much more restrained than the vibrant 2015 version. In the mouth, this wine is dry with medium (+) acidity, medium (+) body and alcohol. The flavour intensity is more restrained, but the wine has a lovely, creamy mouthfeel and a soft fruitiness. The finish is again relatively long. This wine is also very moreish but its style is more subtle. Chardonnay – especially one with a bit of personality and body like this one – is always going to be a good choice for chicken, fish and creamy dishes, including vegetables au gratin or other cheesy types of dishes. 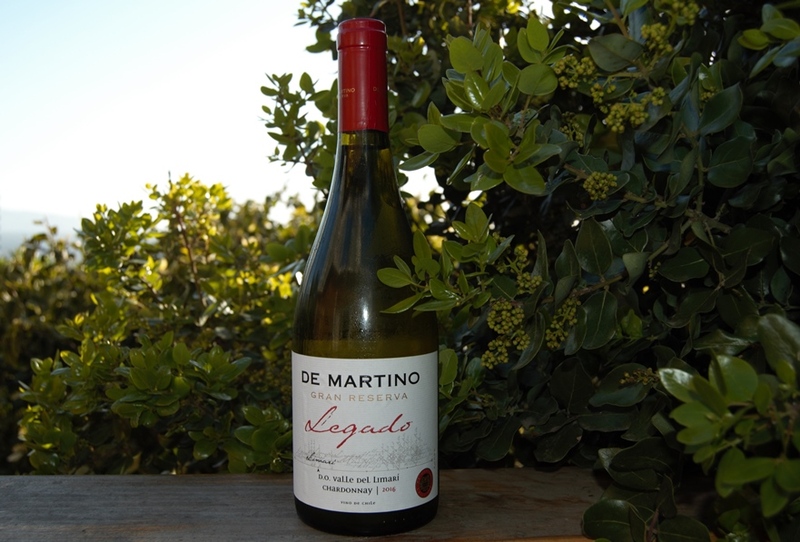 Where can you buy De Martino Legado Chardonnay? In Chile, you can buy wines direct from the winery, at Jumbo supermarkets or Mundo del Vino stores. In the UK, Berry, Bros and Rudd and Waitrose are among several stockists. In the US, wine.com stock some De Martino wines. So why the difference between the two wines? In Europe it’s well-known that wines vary from one year to another, mainly because of differences in the weather. But in many New World regions, like Australia, Argentina and Chile, where the weather is a bit more reliable than in the likes of Bordeaux, the myth has arisen that the wines are the same from year to year. Not true and De Martino Legado Chardonnay is a lovely example of this. Wines tend naturally to reflect differences in conditions. For instance 2016 was a warmer year than normal in most parts of Chile and rain fell just when it was least wanted, in the middle of the harvesting season. In warm years, the grapes ripen faster, so either you end up with grapes that have more sugar (and therefore wines with higher alcohol) and less acidity or you pick them earlier, when their aromas and flavours are less developed. Meanwhile rain in the period around harvesting can make the grapes swell up with water (creating wines with a more dilute flavour) and/or cause them to rot. So what I think happened at De Martino in 2016 is that they saw the sugar levels in their Chardonnay grapes rising and the acidity dropping and knew that rain was possible, so they took a decision to harvest the grapes earlier than normal. This safeguarded the acidity levels. While the 2016 wine has less acidity than the 2015 vintage, it’s still very refreshing. It also stopped the grapes from stockpiling so much sugar that the wine ended up being very high in alcohol – indeed the 2016 vintage has slightly less alcohol than the 2015 one. The other side of the coin is that the wine has more subtle aromas and flavours, because these had less time to develop in the grapes before harvesting. How come so many wines don’t vary from year to year? Let’s face it, most consumers around the world like certainty when they are buying a product. They don’t want it to change from one purchase to the next. And so winemakers at many wineries apply great skill to ensure that that their wines are more or less the same from one year to another. In addition to picking the grapes earlier or later to get the desired qualities, they can add more acidity, reduce the alcohol or add a dash of another grape variety to achieve this. So most of the really big name brands of wine will tend to be very consistent. Other wineries – often the smaller or boutique ones – have a different – and arguably more daring – approach, allowing the wine to tell its own story. Wine geeks like me enjoy that element of the unknown in uncorking a wine we’ve tried before and encountering something a little different. Of course, this can lead to disappointment, if you don’t like a subsequent vintage of a wine you previously liked. But the likes of De Martino strike the balance between allowing the wine to be expressive without the style becoming unbalanced, for instance by excess alcohol. And this takes a lot of skill and experience. I’d love to hear your opinion. Do you prefer your wine to be consistent every year or do you like the surprise of vintage variation? Have you been disappointed (or delighted) by a particular vintage?